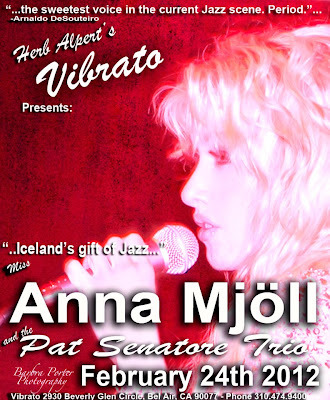 Your best choice for tonight in California: the LA-based Icelandic jazz princess Anna Mjoll with trumpet master Lew Soloff and the Pat Senatore Trio live @ Herb Alpert's Vibrato in Bel-Air (2930 Beverly Glen Circle). 9PM! NO COVER but reservations are a must.